Ryan, in his first year as a head coach, came to the Jets from Baltimore, where he built a reputation as a top defensive coordinator. Coming into the game, his defense had not allowed a player to rush for 100 yards in a game. The Jets’ defense seemed inspired again on the second Jacksonville possession of the half, which ended with a nine-yard sack of Garrard by Jim Leonhard. This forced another Jaguars’ punt and the Jets took over at the 45-yard line of Jacksonville. Why not simply run the play that was called in the hurry-up? Nobody offered a reasonable explanation. Then came the defensive breakdown. Before Marcedes Lewis' 33-yard reception, which put the Jaguars on the Jets' 14, Jim Leonhard was screaming at Rhodes, trying to change the coverage. Too late; Rhodes, expecting help that never came, was burned. "It's on me," said Leonhard, claiming he should have used the Jets' final timeout. "For the defense we think we are, we needed to make that last stop and get the win," safety Jim Leonhard said. No pass was more important than his 33-yard completion to tight end Marcedes Lewis. It moved the ball to the Jets’ 14 with two minutes left to set up the decisive plays. 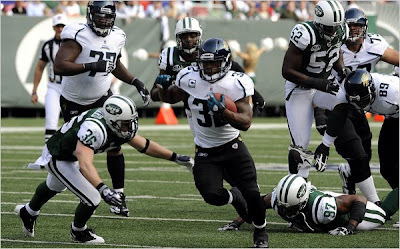 Lewis was tackled by safety Kerry Rhodes. The Jets did not play last weekend, and Ryan made the unusual decision to give his players six days off. He said last week that his decision would be judged by Sunday’s result. The Jaguars quickly marched 80 yards, with the critical play coming on first-and-10 from the Jets' 47. David Garrard connected with tight end Marcedes Lewis for a 33-yard hookup over Kerry Rhodes to the 14 just before the two-minute warning. The Jets got caught in the wrong alignment and safety Jim Leonhard took the blame, saying he should've burned a timeout. "We initially had the coverage locked in, and it was too late to try to get it changed and you saw what happened," he said. "It was just a mistake." S Jim Leonhard injured his right thumb when he missed a tackle on Jones-Drew’s 33-yard touchdown early in the first quarter. After getting it wrapped, he returned. The extent of the injury is unknown. ‘‘They took some X-rays,’’ Leonhard said. ‘‘We’ll find out more (Monday). It doesn’t feel good. I’ll tell you that much." 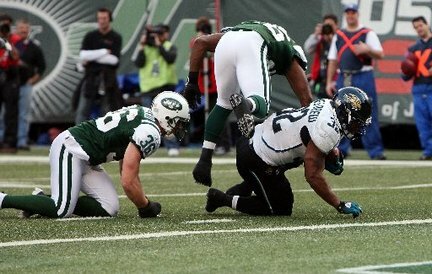 Safety Jim Leonhard made seven tackles and a blitz sack of Garrard in the third quarter to stall a drive and keep the Jets within 21-13. 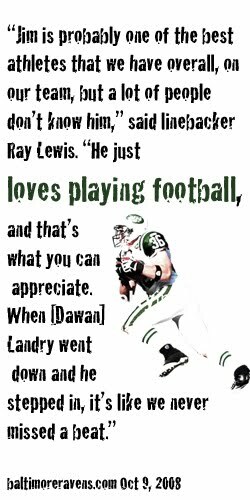 But the QB of the defense took the blame for allowing the big play on the final drive – a 33-yard pass from Garrard to TE Marcedes Lewis to get the Jags to the Jets 14.